Many have noticed that Wilderness is sold out. We have no more copies of it, which makes it our first soldout game. This is cause for celebration, of course! 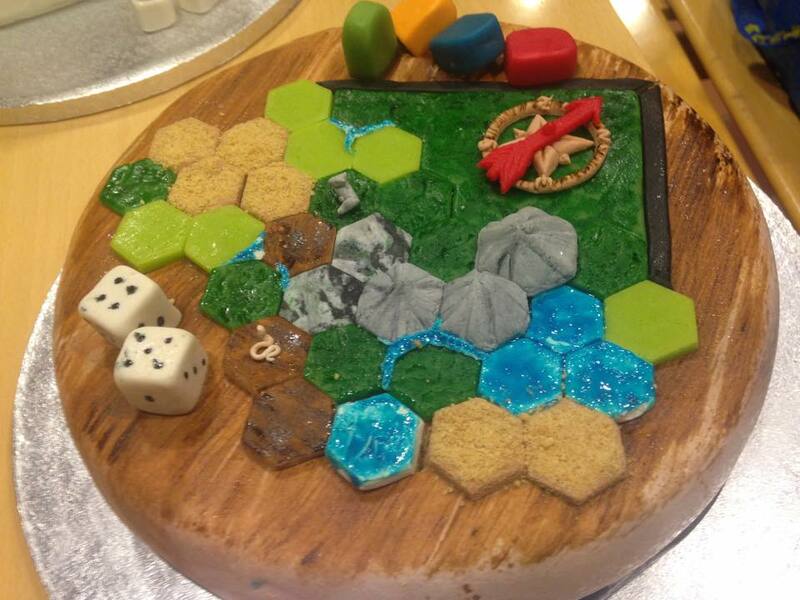 Coincidentally, a friend in Karlstad ordered a cake for our gaming group with a Wilderness motive, to celebrate some of the members’ birthdays. With a taste of kiwi cake in our mouths, we raise our glasses together with all of you who have helped us make this game a success! The Wilderness story is not over, however. We hope to make a reprint in the future, with some updated rules, new graphics, and a prettier production. Anything to make it more enjoyable for you to die in the Wilderness. For all you veteran players out there, special rules for the Wilderness Hunger Games Scenario and for both of the Space Station Solitaire versions are now available for download on this website! Are you literally sick and tired from racing to the village? Wouldn’t it be easier to just kill all the other players to be the last man standing? This is what the Hunger Games Scenario adds to Wilderness! With these special rules you can no longer win by entering the village, your only goal is to be the last survivor. With a different gameboard set-up, some new rules for interaction, and a more aggressive atmosphere, this will surely add variety to your game. We’ve always said it’s hard to find an opponent in outer space. But don’t worry, we’ve created a bot which is clearly more designed to survive without oxygen than you are. And since they’re massproduced, why not take on two of them at once? In the Bot Version, you play against simulated opponents. They are not as smart as you, but they get certain advantages that will even that out. Can you beat the bots? Back to the Space Station Training Academy, where the simulation of construction is all there is. No meteor storms, no malfunctions, no time consuming bureaucracy, and especially no evil-minded competitor. Your goal is to build the best possible space station without event cards. It might be peaceful, but that doesn’t make it easy. Each year, the number of modules you need of each color to score Victory Points is increased, and to win and graduate from the Academy, you need 22 VPs. Can you do it? Feel free to send us your stories and achievements from these alternate versions. 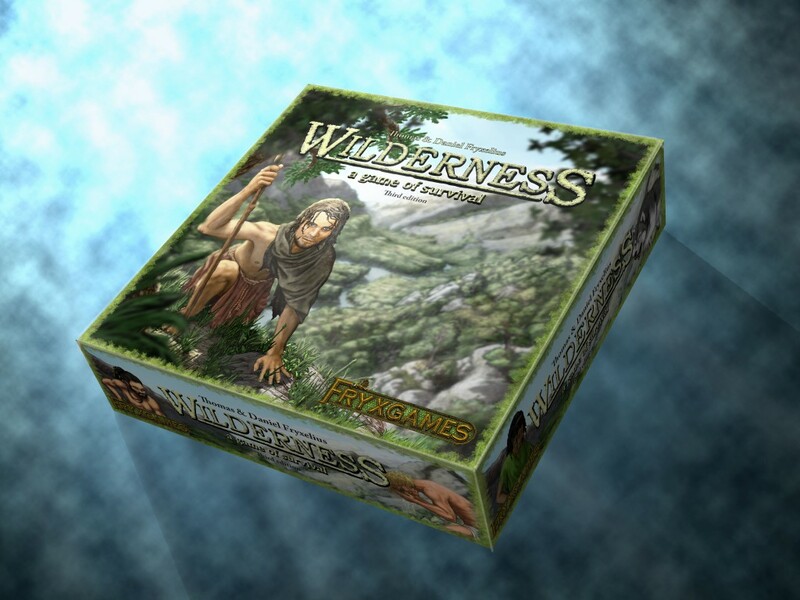 At the Essen Spiel’13 games fair in Germany, we will release a Promo Pack for Wilderness. We have acted on several requests for women in the game and designed 3 new Health Boards for this purpose. The Promo Pack consists of 3 healthboards and corresponding stickers so you can exchange the green, yellow, and blue male characters with new, better-looking female ones. These limited edition promo Health Boards will only be available through us, and might run out of stock in Essen. Buy the FryxGames Game Pack to get our promos for free, or buy them separately. Even though Wilderness offers endless combinations of landscape tiles, we felt that we could offer even more variety if we added a few rules. So we now proudly present an alternate scenario for Wilderness, the Hunger Games scenario! 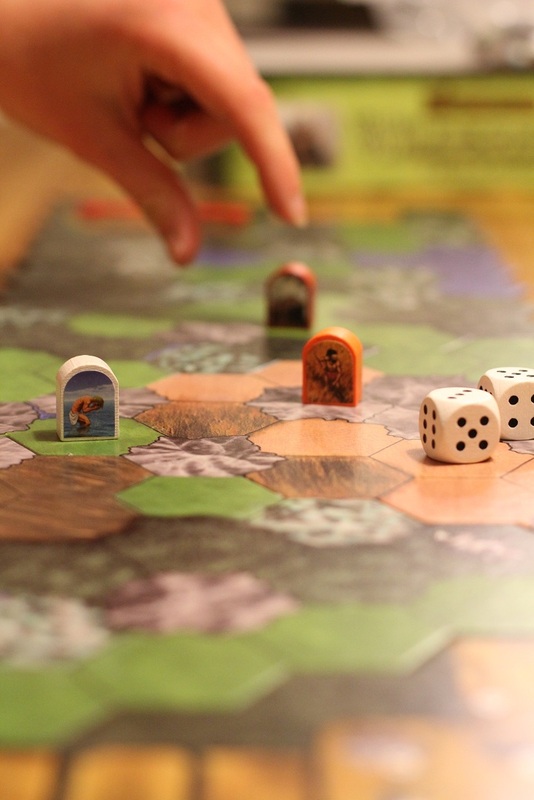 In the normal game you place the landscape tiles in a row and discover them as you move along. 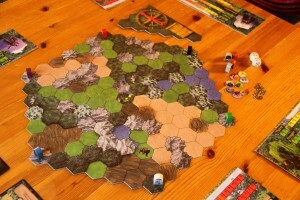 In this scenario you place 6 random tiles in a circle with the village (supply area) in the middle. (See picture!) The players (2-8) is spread out around the rim of the board and want to get to the center to receives bonuses. This is a last man standing where it’s all about surviving and hurting the other players. Brutal, but fun! – Each time you move into the supply area, draw 2 event cards and 1 random player token (use all 8 tokens). If you draw your own token, draw 1 extra event card. If you draw an opponent’s token, they walk into a trap: roll a die and get as much exhaustion. If you draw a token of a player not used in the game (or a dead player) place the token anywhere on the game board. It will move and attack the same way as the wild animals, but will be inactive this very first Nature’s turn. If the player token is defeated, it is immediately removed from the game. Unlike defeating an animal, you don’t get any hunger back when killing a player token. – Each time you have been inside the supply area, you must move to the edge of the board before you go to the supply again. – Fight: If a player enters the same area as another player, a fight occurs, and both players roll 2 dice against each other, just as in the “Fight event card”. During fights, all event cards regarding animal attacks may be played. Opposing players or tokens count as animals. The Wilderness Rulebook is now also available in French and German! This is a great step, since these languages have been requested for quite some time! At the moment, we are also working on several other translations for Space Station and Brawling Barons. All three of our games will be available at the Essen Spiel 2012 game convention. We’ll be in booth 4-415, prepared with Swedish candy to feed anyone who wants to have a look at our games. See you there! 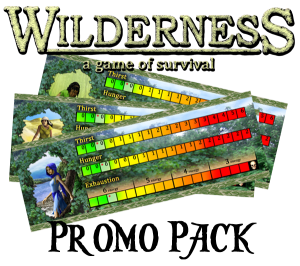 We are happy to inform you that the Swedish rulebook for Wilderness is now available for free download. It can be accessed here and in the left menu of the Wilderness game page. Enjoy! If you cannot see the video, click here! The Spanish translation of the rules to Wilderness is now available in the Downloads Tab of the Wilderness main page. Swedish and German rules will also be available soon, so stay tuned! We have also updated our How to Order tab to include more information. Enjoy!